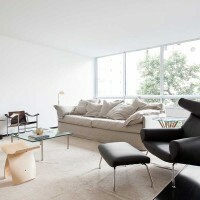 Felipe Hess has designed Apartmento Sergipe, an apartment for a young actor that lives in Sao Paulo, Brazil. 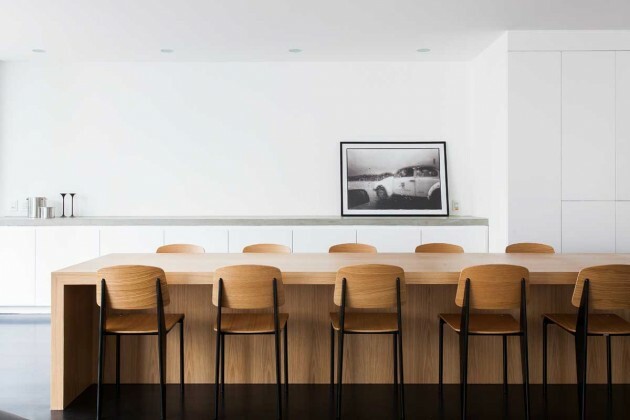 This apartment was designed for a young actor that lives alone. When we started the project, he asked for an open and clean space. 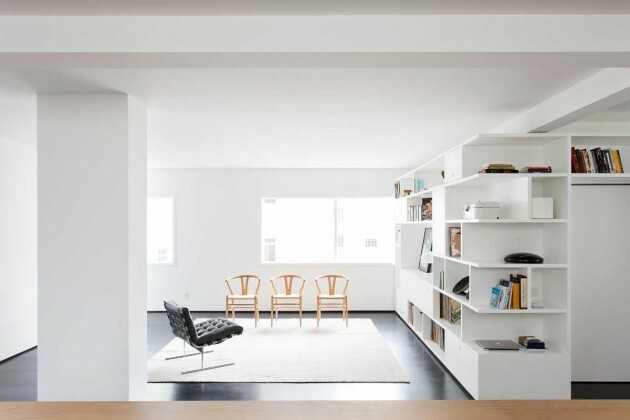 The apartment in a beautiful modernist building from the 60s had an plan with lots of rooms and divisions. We decided to open everything, connecting all the social areas. After tearing all the walls down, the elevator remained in the middle of the apartment. 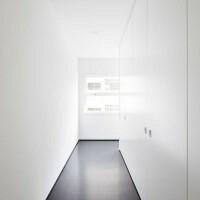 We put a white box with shelves wrapping and hiding the social entrance. The box helps to connect the areas facing the living / tv room, the rehearsal area and the big table. 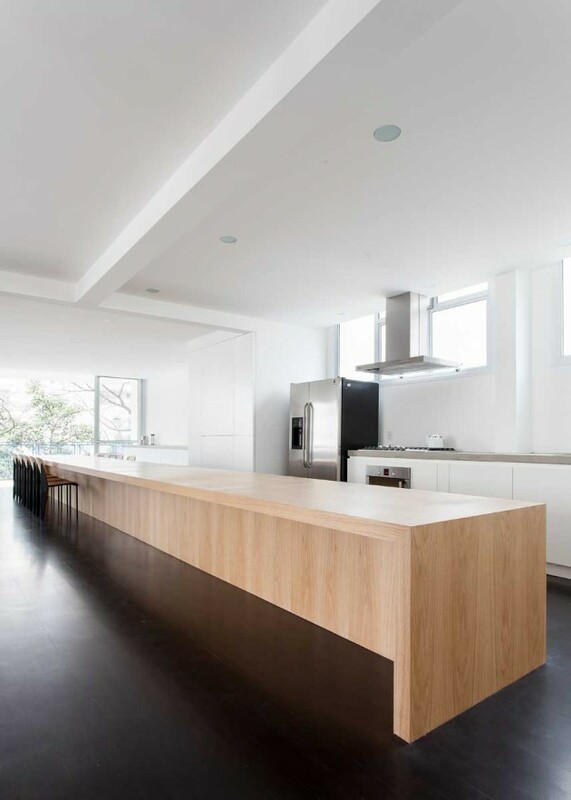 The huge wooden table has 10m and connects the areas and change its function along it. It goes from dining table, to office (it has some bidding plugs) and reaches the kitchen. The elevator entrance hall is a yellow tile box. 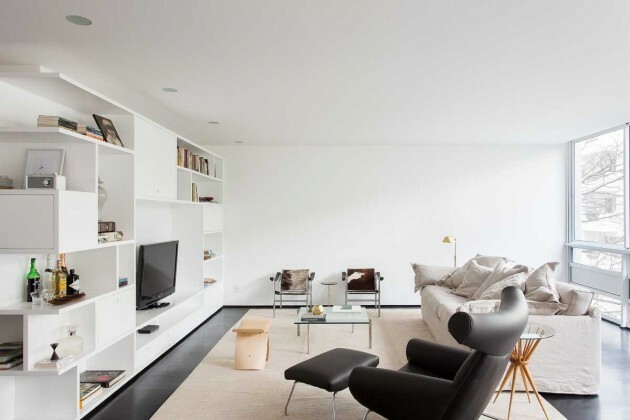 Its idea was to contrast with the pure and calm colours of the apartment (mainly white, grey and black). We used yellow tiles on the floor, walls, ceiling and the doors. To open the door you click on of the tiles and it opens. Behind it the is a key pad that with the correct pin opens the door. This idea was to avoid a handle on the door and then have a pure tile box. 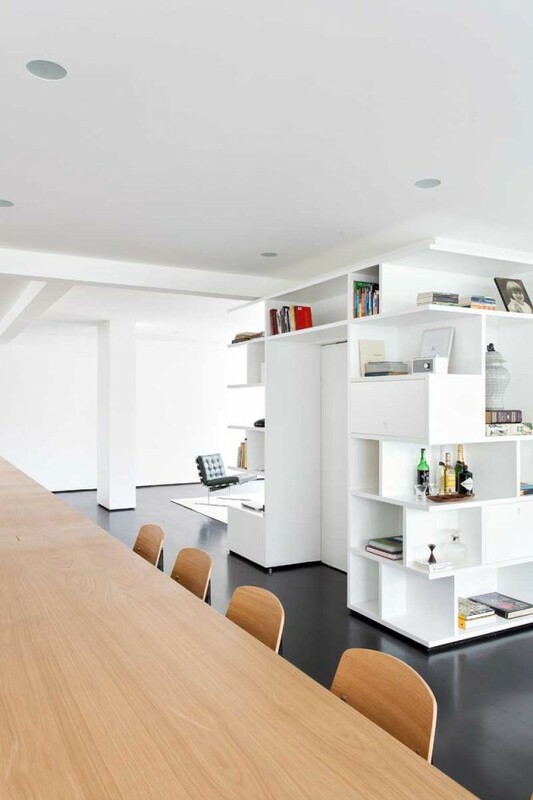 After the yellow entrance hall, passing trough the book shelve you reach an open area with the huge table. In one side, is the living room / TV room and dining area. 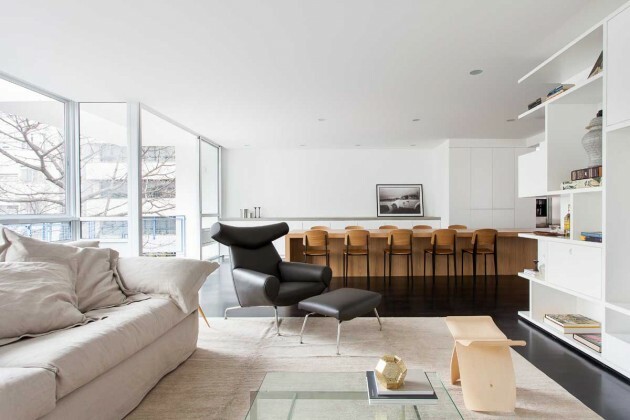 The living room has a Hans Wegner Ox Chair, a pair of le Corbusier arm chairs,, a PK table. This area is opened to the big windows. 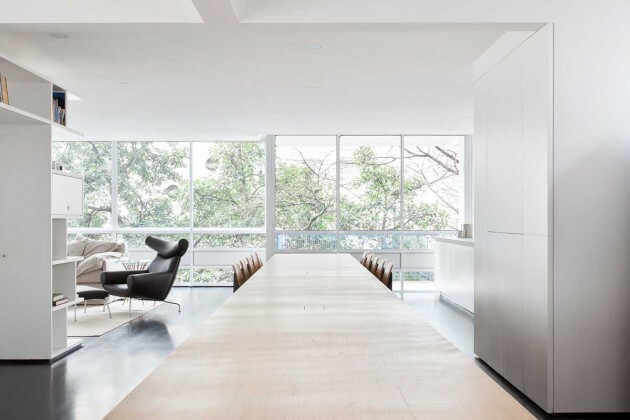 The dining area has some Jean Prouve chairs. 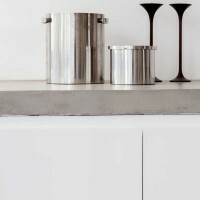 Behind the dining area, a concrete plan is used to serve the food. On the other side there is an open kitchen with the same concrete plan and an open area to rehearsal the plays. 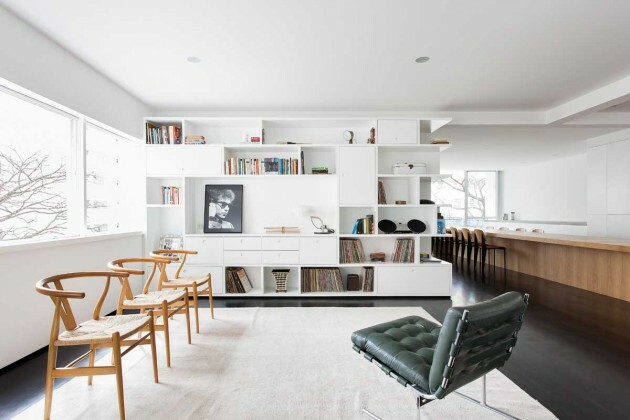 Is a flexible area, with some Hans Wegner Wishbone chairs and a vintage Jorge Zalszupin Senior chair. Behind it a huge white wall divides the social to the intimate area. On the intimate area there is a small toilet for visit and the master bedroom with its closet and bathroom. The bedroom is very simple, with the cabinets designed by us using the same wood from the huge table. 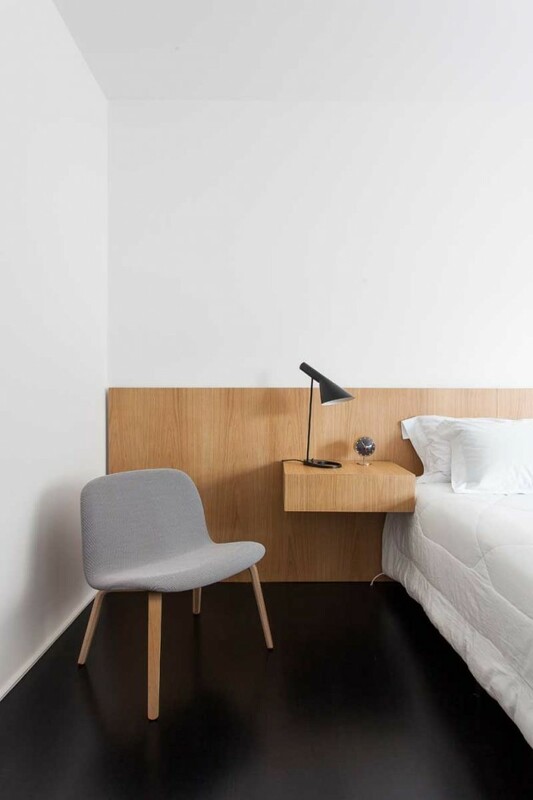 a Muuto chair, a AJ lamp and a George Nelson are found on the bedroom. 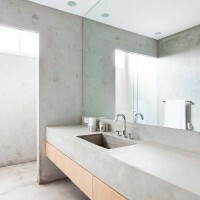 The bathroom is totally made of concrete and the cabinet uses also the same natural wood of the table. 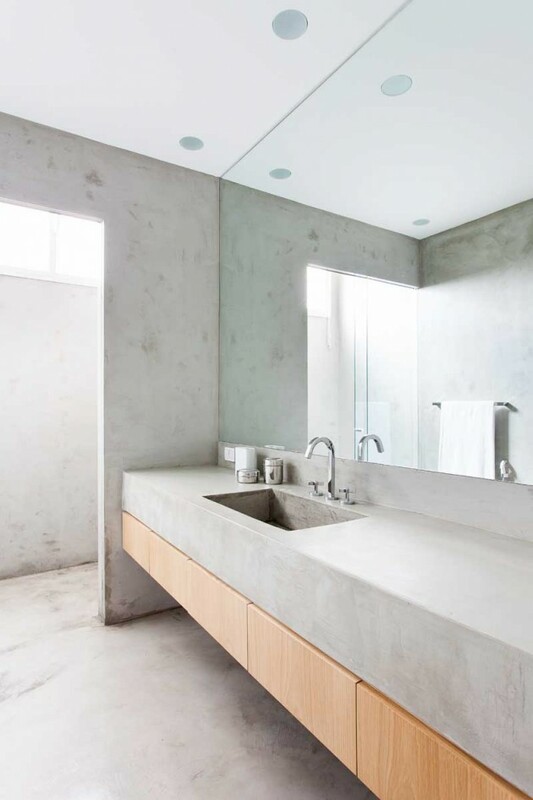 The small toilet for visits receives some natural light from the laundry. 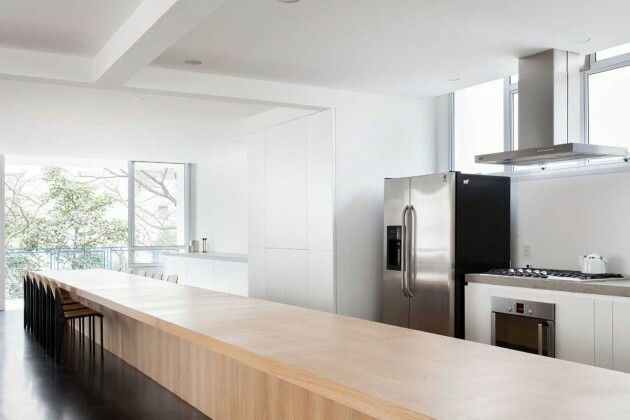 The apartment has a very simple and precise design.